Spring is almost here, though, and I'd love to be surrounded by lots of colour. 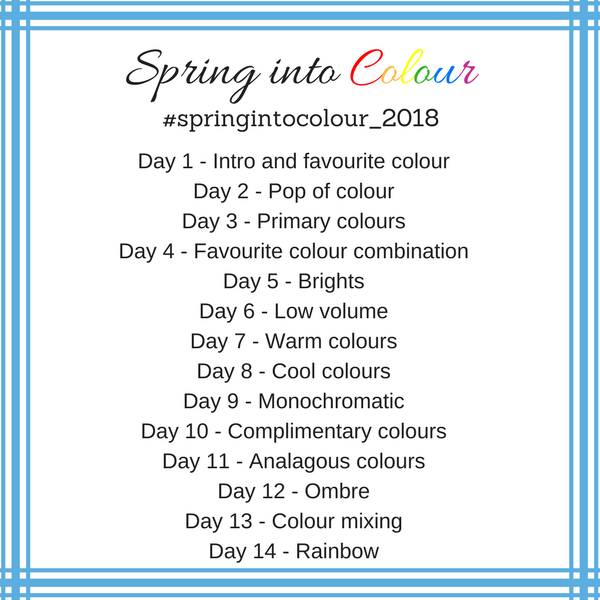 To get a dose of all the colour I'm craving, I'll be hosting my Spring into Colour Instagram photo challenge again this year. This will be the third edition of the challenge and I'm so looking forward to seeing all the glorious colour that will fill up the hashtag! I hope you'll join in! The fun begins on Tuesday, March 20, the first day of spring here in the northern hemisphere, and runs for 14 days with a new photo prompt posted each morning. This year I've changed up the prompts. Rather than using a single colour as a prompt most days, I've chosen categories of colour, like 'analagous colours' or 'primary colours' to give everyone a chance to use the colours they like best. Here's the list of prompts. We'll be using #springintocolour_2018. Don't miss the _ before the 2018, or the 'u' in colour (I am Canadian, after all 😊). And did I mention there are prizes? Well, there are! Thanks to some wonderful, generous sponsors, I have the following prizes for participants in the challenge. Three 6-month subscriptions to Make Modern magazine (affiliate link). A $50 gift card to Mad About Patchwork. Winners choice of 2 PDF patterns from Quilting Jetgirl. A $50 USD credit towards patterns in the Sew Fresh Quilts pattern shop. Winner's choice of 2 PDF patterns from Slice of Pi Quilts. And I'll add a prize myself, which will be the winner's choice of 3 PDF patterns from my pattern shop. To be eligible for prizes, IG accounts must be set to public for the challenge. I'll use a random hashtag picker to choose the winners the morning of April 3rd and they'll be contacted by IG message. The more photos you post in the challenge, the more chances you have to win! *Note, this post contains an affiliate link, which means that if you click the link and then make a purchase I may receive a commission. This does not affect the price you pay. Sounds like fun Leanne, and a welcome boost to what has been a rather grey month so far! I want to try to win one of your generous sponsor prizes! I love all those sponsors! Such Fun!